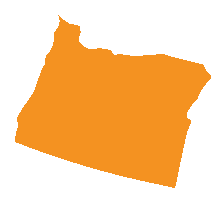 Oregon is a location chosen as a targeted community through the Vocational Rehabilitation Technical Assistance Center: Targeted Communities (VR-TAC-TC) or Project E3. Project E3 will partner with State VR Agencies and local community partners to improve outreach and employment-related services to underserved people with disabilities in this community. Oregon is in the Pacific Northwest on the West Coast. It is primarily rural state and is one of the most geographically diverse states with volcanoes, dense evergreen and mixed forests, many bodies of water, high deserts, and semi-arid shrub lands. The generally mild climate and variety of natural landscapes makes Oregon a beautiful and popular place to visit. Oregon’s economy is mainly driven by agriculture, fishing, and hydroelectric power. It is also one of the largest timber producers in the United States. Following are some of the key strategies being developed and implemented to address the targeted populations’ challenges and barriers to employment. Community of Practice (COP) and Proceedings for Blind and General Vocational Rehabilitation Agency Counselors serving Rural and Remote Areas Outreach and Engagement: Provide information on Social Security program rules and how employment impacts benefits. The goal is to help people make informed choices about employment. Braiding and Leveraging Resources: Increase the capacity and interrelationships of community partners to build a coordinated and comprehensive support system, including connections to federal and state programs. Transportation Barrier Assistance: Explore the expansion and improvement of existing public transportation services as well as develop informal transportation options in the community. Develop Web-Based Resources for Transition-Aged Students, Educators, and Parents: Work with community partners to develop and disseminate a series of webinars related to preparing transition-aged students for employment. Self-Employment and Home-Based Opportunities Training: Develop and deliver training materials to the Oregon Commission for the Blind Counselors on the effective development of self-employment and home-based employment opportunities, with a focus on issues specific to issues associated with OCB clients in rural areas. 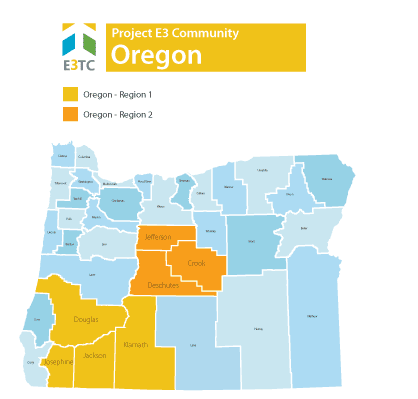 Project E3 will provide Oregon’s state Vocational Rehabilitation agencies and their partners with the skills and competencies needed to effectively and efficiently address barriers to competitive integrated employment and community integration encountered by persons with disabilities in these regions. We will leverage promising practices, knowledge, and experience gained from this project to expand employment opportunities for individuals with disabilities from underserved and economically disadvantaged populations throughout Oregon and across the United States. Increase applications by new or returning applicants who are found eligible for vocational rehabilitation services. Increase the number of participants who have closed cases and receive employer provided insurance at closure. Increase the average earnings of participants at closure.